Primacoustic's new Paintables Clouds acoustic panels are now shipping. 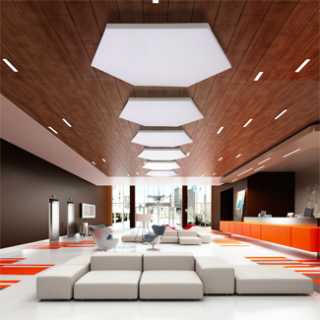 "The series features three different shapes of absorptive acoustic panels that can be used as ceiling clouds, baffles, or wall panels to reduce excess reverberation and improve intelligibility," said Primacoustic's Jay Porter. "The unique shapes and sizes open the door for architects, designers, and installers with creative solutions that are bold, yet architecturally pleasing." The new Paintables clouds include the circular Cirrus, the hexagonal Hexus, and the square Altos. Each panel is made from 1-1/2-inch thick, high-density 6 lb. glass wool for even absorption, plus resin-hardened edges with micromesh, that together fully encapsulate the panel to prevent dusting. Paintables are factory-painted on all sides in absolute white latex and ready for mounting. Unique to their design is a proprietary surface than enables a user to lightly spray paint the panels to color match the decor without affecting the acoustical performance. Paintables clouds are the designed for spaces where communication is vital and acoustic treatment must integrate with the aesthetics of the room, such as houses of worship, conference centers, restaurants, offices, boardrooms, educational facilities, community halls, hotel auditoriums, broadcast facilities, museums, retail, home theaters, recording studios, gymnasiums, and performance halls.